Pictionary is great for date activities, work parties, or to play in any large group. 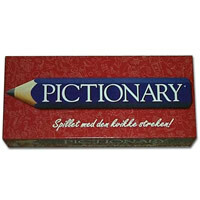 Pictionary is a board game where a player from each team take turns drawing a word on a card that they pull. Their team members need to guess this word with no other hints other than drawings. You don't need to be a great artist to be good at Pictionary. You just need to be creative and draw the right things at the right moment to win this game. To keep the game interesting, there are also extra activities on the game board spaces and depending on the space your team lands on, your next topic is assigned. With close to 500 cards having 5 words on each, this board game can easily keep everyone entertained for hours. Don't forget to check out our instructions on how to play Pictionary. Pictionary has been a popular board game for years and a fun activity for everyone! To beat your opponent(s) at Pictionary, your team will need to correctly identify the right word from clues drawn on a piece of paper. Each word correctly guessed advances your token closer to the Finish square. First one to reach this square wins. This game includes the Pictionary board, a one minute timer, 4 category cards, 496 keyword card (5 words per card), die, 4 pads of paper, 4 pencils and the official Pictionary board game rules. Once the Pictionary board has been laid out, place the box of cards in the middle of the board. Hand out the category cards for reference and teams are created (preferably equally). All teams start on the "Start" square and will need to have a pencil and pad of paper. Determining who goes first is simply the team that rolls the highest after choosing who on each team will be drawing first. "All Play" is the first round so everyone on that team can guess. The Pictionary rules for game play are as follows. Each team draws a card at the beginning of their turn which will tell you what you will be drawing based on the color space your team's token is currently resting on. The chosen person to draw then has only five seconds to look at the card and plan their drawing strategy. The one minute timer starts and the person drawing for the team begins drawing without using any verbal communication or gestures. Writing numbers or letters on your paper is against the rules. The same team that is drawing is now trying to guess the drawn clue. If this is accomplished in less than one minute they advance themselves on the Pictionary board by rolling the die and a new card is drawn. Rotating drawing team members (the person drawing the clue) is part of the rules. As part of the Pictionary objective, the first team to guess the correct clue on the Finish square is then named the winner of the game. It does not need to be your turn to win. Allowing answers to be plural or singular are rules that teams need to decide upon before the game begins. If you wish to locate something on the paper or cross something out, you may use an "X" as long as it is not used as a letter. You are not limited to the number or amount of paper that is used per clue. Having pre-arranged clues or secrets within the team is against Pictionary rules. Common mistakes include drawing lines for each word in the clue indicating how many words to guess or drawing an ear to indicate that is sounds like something else. Spelling does not matter meaning that a player can draw clues for the word "chute" even though the card says "shoot." Share with us your comments, funny stories, tips, advice, strategies, creative ways to play, questions about how to play, problems with the rules or anything you want about Pictionary. All submissions will be reviewed within 24 hours. Click here to add your Pictionary comments. We played the first Edition. My family had two teams.If Team#1 drew for All Play both teams guessed. The team that guessed correctly got to go next. If Team#1 drew not an AllPlay, if their teammates guessed correctly, they got another turn. Otherwise, it became Team#2's turn. There always was only one team drawing at a time. Is this acceptable? It is not legal to look at the other teams drawings during all play. This was a big argument in our family and finally I found the rule online. Clue was Perk. response was percolator. As the word perk in included within the response, and spelled differently (but derived from the response word) was this a qualifying answer? Bitter debate ensued. The clue was England and my aunty drew the English flag. Is this legal? Next however she pointed to it and said "what is this!?". I know that that is not allowed but was just wondering if drawing a countries flag is legal without the speech. In the case that we land on an all play, but the die that makes it complex says two words in the same time, do the teams have to guess both or just whoever gets the first word wins or how does that work? Seems like there are always arguments over the game rules as far as what you can do and what you can't. Be sure everyone is playing by the same set of rules so you can play pictionary instead of wasting time taking about how to play pictionary. Question: During an AllPlay, are you allowed to look at the other team's drawing? This was a dispute we had with the game. Absolutely. This is a good house rule. If the word is Penitentiary and the team guessed "Prison", is it acceptable to declare a win since the two words penitentiary and prison are considered synonyms and mean the same thing? Hello all :) If the word is simply "attack" and the guesser shouts out things like "dog attack" or "bear attack" or "animal attack", have they correctly guessed the word by having said "attack" several times, despite another word being placed in front of it (i.e. dog, bear, animal...) or does the drawer need to get the guesser to ixnay the words before it and only say "attack" by itself? Thank you in advance for any help on this. Just want to know, If its something like Ball PEN. Lets say somebody guessed Ball, Can I write 'Ball' on the paper because they guessed it and start working on 'Pen'? You have 3 groups. It's team a, b and c. The rotation starts from team a, then b, then c. It's team a's turn and the card said it's an All Play. Team c guessed it write. So it's now their turn, right? Let's say it is. So the get a card but failed to guess the word. Who's turn is it next? Team a or team b? We had an interesting dispute recently. The word was "erase" and the picturist drew a rectangle and began drawing sticks in the rectangle (to represent a chalk or white board, etc.). The picturist then erased the items he had drawn inside of the rectangle and began redrawing within the rectangle. At that point, a member of the opposing team yelled out, "you can't do that!" and immediately thereafter the word was guessed. Was this an infraction of an Pictionary rule?? I thought it was a very unusual circumstance. Thanks for your comments. A lot of these questions should come up when deciding the "house rules". The person who owns the game should decide on any questionable calls. That being said... Logan: Pen and pin are completely different sounds when coming out of the mouth and unfortuately due to the fact the drawing was obviously (I'm assuming) a PEN then no dice. However mail for male is completely acceptable for example. Jerry P: Jono provides a great answer for that. Jono: The symbol for pi should be illegal as it is just that, a symbol. Confusion in Oh: Drawing an arrow to another physical object in the room would be considered cheating because the rules clearly state that you have to "guess the clues drawn on a piece of paper". Brenda: Although I applaud the efficient time management this is definitely a rule that needs to be clarified before hand to use. I personally do not let pictures be used for different clues because it makes the came more fun when everyone has to start from scratch. I am not aware of a specific rule for or against it though. We just finished a game at our neighbour's house and were called for cheating because we already had a face on the paper from and earlier guess and the word was "ear" so she just added an ear to the face...it was also an AllPlay word....is this cheating??? I'd say it was efficient time management. We had a family game of pictionary going when my sister's turn was up to draw. Her word was "pinky" so when she drew the picture she drew an arrow pointing on the tablet to her pinky finger that she had lying on top of the paper. This caused a family meltdown? Was that legal? Jerry P, we've played that you have to finish with an exact roll, but we've also played the other way, it's your choice. I have another question. for "cherry pie" a player drew a cherry and then the symbol for pi. would symbols like that be legal? you're 3 squares away from the finish square...do you have to roll a 3 to get there? or can you roll a 3 or higher?? There was a dispute during a recent round of pictionary regarding the pronunciation of the word 'pin'. Rather than bias the argument by exposing my position, I will simply ask, is the drawing of a 'pen' and the subsequent pronunciation (whatever it is) acceptable?